While some martial arts schools try to redefine themselves constantly with flavor-of-the-month styles, Aim and Focus concentrates on what they know. Johnson left the corporate world to start Aim and Focus 15 years ago and moved to their current facility at 8516 Anderson Mill Road in 2012. He has four instructors and nine employees. “I came to a crossroads in my career and decided I would rather influence people’s lives,” said Johnson. Aim and Focus classes emphasize the full spectrum of the martial arts experience by going beyond physical and technical proficiency into the behavioral aspects of training. The school also offers a basic, non-martial arts women’s self-defense course and they are a state-licensed daycare provider with a popular after-school program. Each summer, 140 children attend the Aim and Focus camp where martial arts training is combined with more traditional camp activities such as skating, movies and park trips. The breakout star of Aim and Focus is 18-year old Holly Holt. Among her many titles, she recently won the Tang Soo Do Mi Guk Kwan National Grand Championship in Women’s Sparring. 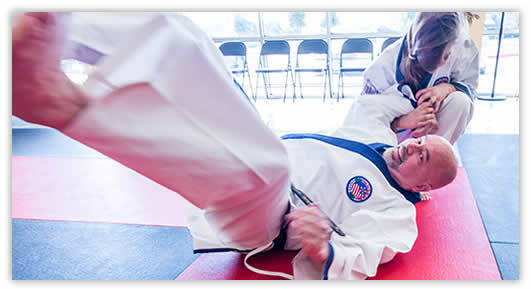 She has been training at the school for six years and can attest to its benefits beyond the self-defense aspect. “I am studying piano in college. The timing and awareness of others that I’ve learned in my training here is very much like music and playing with other musicians. Competing in Tang Soo Do Tournaments at a very high level has helped me overcome my stage fright,” said Holt. For Aim and Focus Karate’s banking needs, Master Johnson returned to an old friend from his corporate days. Remembering that Amplify Credit Union had its roots as the IBM Texas Employees Federal Credit Union – of which he was a member – he went to them when other banks weren’t meeting his needs. As Master Johnson has expanded his business over the years, Amplify has been there to help. No matter how much the business grows, however, its emphasis remains the same. “The goal has always been to teach self-respect and self-confidence,” said Johnson.